I wanted some new decorations for our Christmas Tree this year, but really didn't want to pay for any. I had inherited a bunch of miss-match glass beads from a friend and decided it was time to put them to good use. 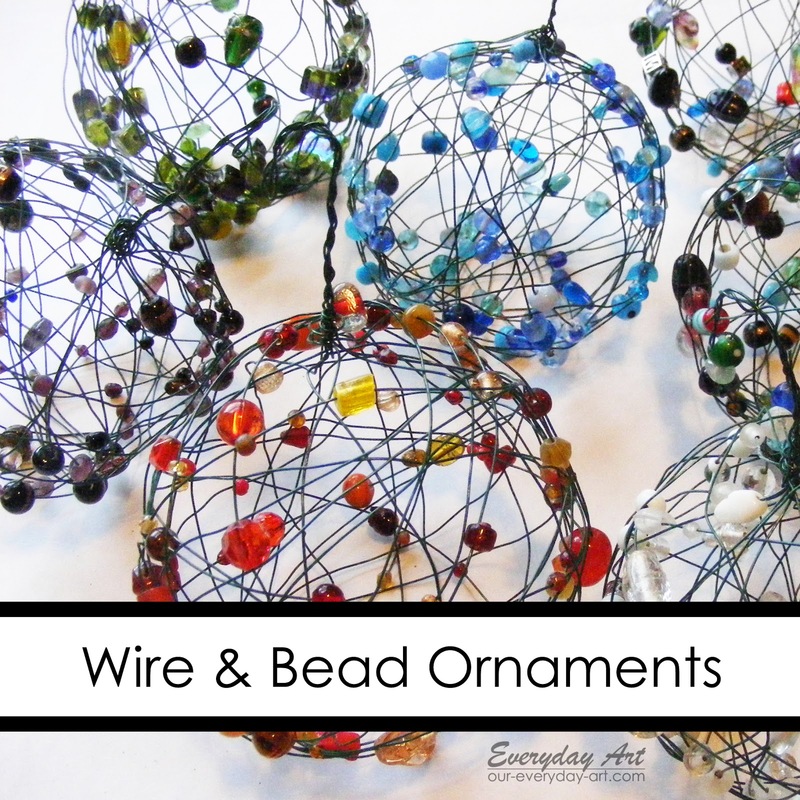 Enter 'free' wire and bead ornaments! One of the best parts about making these was that my 5 year old could help! Stringing beads on wire is really cool when you're 5. Especially when you can pick any crazy beads you want. I used similar colors for mine (all reds, greens or white...) but David liked to pick the 'cool' beads. He said I was missing out and in the end he may have been right. His looked pretty cool, especially on the tree. 1.String about 2 1/2 feet of beads onto wire. Don't cut the wire at this time. I used 24 gauge painted floral wire. (I tried 22 gauge too and it worked but not as well.) It helps to have some beads that are a little bit bigger. They keep the wire slipping and uncoiling when it's done. 3. continue wrapping, moving the beads into place and twisting when you cross the top every so often. 4. When all your beads are on the balloon, cut your wire with about 3 feet extra. Continue wrapping the wire around the balloon, lacing it through some of the larger beads. This helps everything stay in place and not uncoil when you pop the balloon. 5. Finish wrapping and loop the wire up and down a couple times to make a hook at the top. (I like to loop the tail end under the whole mess of wire at the top and twist to hook them together. If it still feels a little flimsy you can cut another few feet of wire and wrap some more. 6. Pop the balloon and you're done! Now just hang them on your tree and watch them sparkle! Those are really pretty. Maybe we'll try to make some today. Dad's gone for the weekend, so it may be a long couple days for me...this would keep the kids entertained. Those are AWESOME!!! Totally love them and want to make some. :) I have a real thing for beads I think. :) Good job. I am with Jamie! AWESOME indeed! Tried this with string but wasn't that crazy about the results but THIS - OMG very, very pretty! Definitely making some!! thank you! Whoa, those are BEAUTIFUL! What a smart idea - thanks for the fabulous tutorial! Definitely making some for next christmas. Loved the tutorial. Good Job!! I Love these. They turned out fabulous. I am going to try to make some a little bigger to see if they work. Jana- it is a little bit tricky. Having some larger beads helped because the crossing wires couldn't slip over the bigger beads. Also try wrapping a little bit snug so the beads stick in the balloon a little. Wrapping the whole thing with extra wire at the end and lacing it through random wire and beads helps hold it all together. Don't feel bad, you're not alone. I had to start more than one over. Good Luck! How much wire is needed for this project? I need to pre-cut the wire for the Scouts. scouterdeb- i didn't measure the wire, but i would guess about 3 yards. Hi, thanks for the tutorial. I absolutely love these ornaments. I have been trying them for three nights, with no luck--so disappointing! Any helpful hints? I can't get the wire to stay on the balloon, or the beads to stay in place. I think this would be great even for summer! Making some for summer yard decorating. I loved it! Christmas Ornaments Fair in Henley are looking for wire ornaments for their show this year! In your picture, I noticed the blue and green one. Earth Day!!! Couldn't wait to try this so I purchased the balloons today. I used 24 Ga Artistic Wire and sad to say it didn't work. I will purchase floral wire tomorrow and let you know if this was the answer! Lo intenté varias veces... pero no lo logré. Qué lástima! Thank you for this beautiful idea. I was quite frustrated when my first attempts failed. Although, looking through the comments, I found I was not the only one. I did some problem solving and seemed to have come up with some helpful tips. First - I didn't fill my balloons as full (closer to an orange, not the grapefruit size I tried at first). Second - I put tape around the balloon; sticky side out, two pieces in an X shape. Third - I kept the beaded wire tighter, rather than looser (this was already mentioned and very helpful). Lastly - I removed the tape very carefully from the inside of the ornament; sometimes I even used two tools, one to hold the wire where big beads were stuck to the tape, while gently pulling the tape with the other. I have already made four and I hope these tips help others succeed in creating beautiful ornaments. Great idea! With multi-colored beads these could be used year round. I am working on the project now and am wondering if there is a trick to keep the beads from slipping down the wire. Thank you for any advice you can give. I just made a lovely smaller ball shape over a small balloon filled with rice. After my first attempt I made the following changes to the instructions: 1) Wrap empty wire around the balloon to create the holding shape for both the inside and for ease of adding beads, 2) Wrap the wire firmly, and hold each bead in place until the wire tension is enough to hold it. Worked well even with the same sized beads. What to do with your Christmas cards?